Kennesaw Mountain Dental Associates is a family dental practice that provides root canals as well as comprehensive family dental care to the residents of Kennesaw and the surrounding areas. The dentist and staff from our family dental practice are dedicated to delivering the highest quality dental care in a warm and friendly environment. By establishing trusting and respectful relationships, we enthusiastically educate our patients for a lifetime of good overall dental health. Root canal procedures do not have to be painful. In fact, a root canal will actually eliminate the pain caused by an infected tooth. Putting off a root canal procedure can lead to serious and painful dental problems such as abscesses and even tooth loss. Our dentist, Dr. Hamir Contractors, offers in-office sedation as well as local anesthesia to keep patients relaxed, comfortable and free of pain during root canal procedures. If you live in Woodstock, Georgia and are looking for a dentist to perform a root canal procedure, call Kennesaw Mountain Dental Associates. 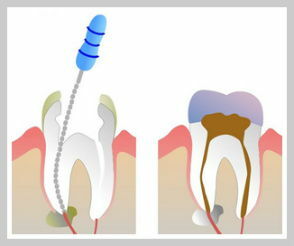 When the nerve and pulp inside a tooth becomes inflamed or infected, a root canal procedure is needed to restore or save the tooth. The procedure involves removing the infected nerve and pulp from the center of a tooth and then cleaning and sealing the inside. Dr. Contractor is a highly trained, experienced dentist and has been performing root canal procedures for many years. Dr. Hamir Contractor of Kennesaw Mountain Dental Associates is a root canals dentist who serves the community of Acworth and the surrounding areas. If you think you may be in need of a root canal, don’t risk your oral health by putting off treatment. Our dental practice is currently accepting patients and accepts most dental insurance plans. We also offer financing options and accept credit card payments for the convenience of our patients. Please contact our Kennesaw Root Canals& Specialists today to schedule a root canal procedure. We look forward to meeting you and to helping you achieve your best smile.